Goizueta’s Evening MBA students in Columbia. Lee Pasackow (University Libraries) was the staff lead for Goizueta’s Evening MBA International Colloquium trip to Colombia in March. Not much more than a decade ago many considered Colombia to be on the verge of becoming a failed state because of its violent insurgency and the narco-trade. Today it is routinely mentioned as one of the most attractive targets of investment among emerging markets. The aim of the colloquium was to understand how Colombia addressed its political problems and strengthened its economic institutions and governance to create a successful environment for trade and investment—and to identify the challenges that still remain. 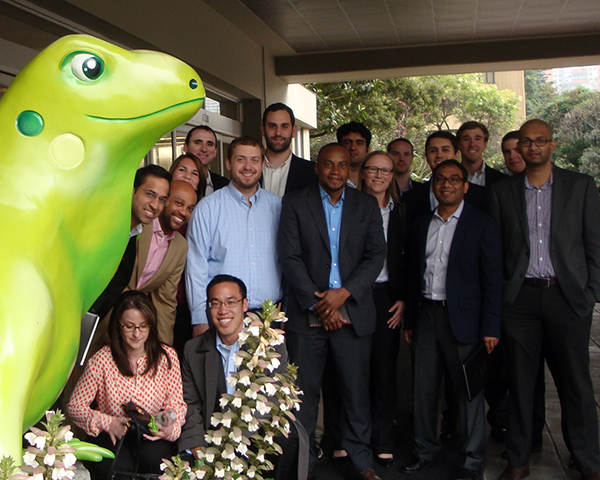 Goizueta’s extensive alumni network helped arrange company visits in Bogota and Medellin including Bancolombia and Ecopetrol (see attached picture.) Prior to the trip, students researched topics such as economic liberalization and macroeconomic management to inform the group of the country’s issues and prepare to engage in discussion during the company meetings. This entry was posted in News and Events and tagged University Libraries. Bookmark the permalink. Post a comment or leave a trackback: Trackback URL.